This past Fall and current Winter, we’ve seen the introduction of various finishes on clothing-metallic finish, wax finish, paint finish, etc. I must say that I LOVE this twist! H&M, being the trendsetters that they are, for months now, managed to incite us with metallic finish sweaters, jeans, etc. 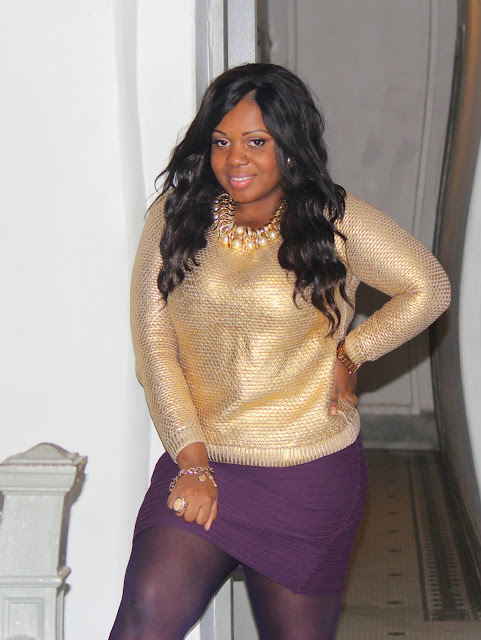 A few days ago, I spotted this awesome cable knit sweater with a metallic paint finish–most importantly IN GOLD AND FOR $9.95! DEAD! I loved this sweater so much, I actually wore it twice in one weekend. I love how from afar, the sweater appears to have almost a scaly fish finish but in closer view, you can clearly see the metallic paint finish. Are you guys into the different finishes out there nowadays? This sweater is really cute! I wish there was an H&M close to me. The closest one is 1 hour and 45 minutes away 🙁 I have driven there once just to shop lol! I LOVEEEEEE THE SWEATER!!! EVERYTIME I SEE THAT NECKLACE I DIE ALL OVER AGAIN SOOO CHIC!! 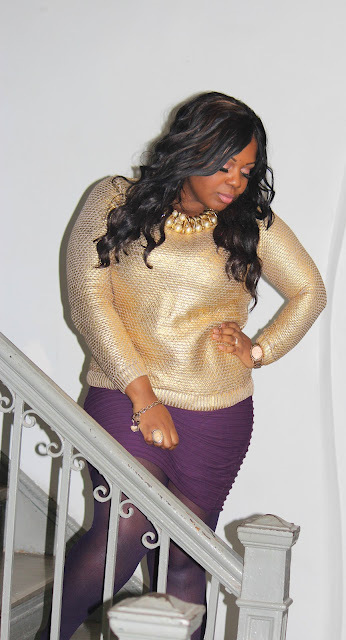 Love the sweater and how you paired it with the purple skirt! Thanks girl. Purple and gold def compliment each other. That is a BEAUTIFUL sweater! I need it! 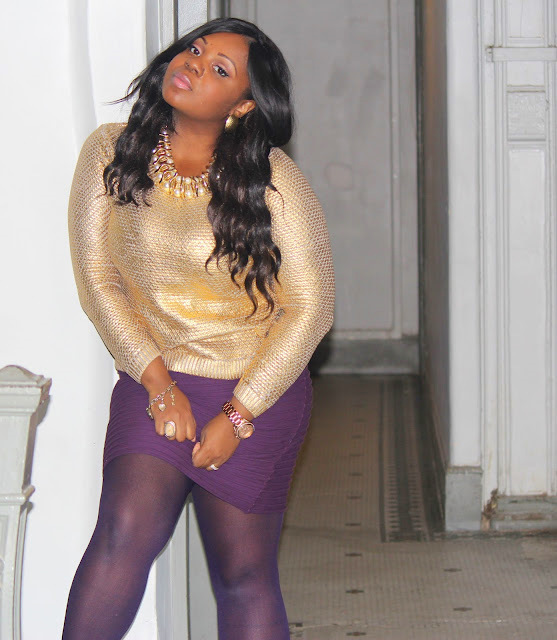 I like how you styled it with the purple skirt. Girl, so do I! I purchased a few pairs like these that I will def post-maybe a diff ways to wear them post. Thanks for reading! Aww thanks Chynna! I love gold and I def love a steal lol. Thanks for reading! love both looks! That sweater is super cute! thanks girl! Gold look amazing against our complexion. Def check it out at your nearest H&M. Hi Crystal! Actually, the online store will launch next Fall! So def look out for that. In the meantime, check out your nearest store for some amazing deals! Thanks for reading! I love that top!!! …and with the purple skirt, it looks so regal!! Great outfit post! Thank you so much! I just checked your blog and I LOVE!! First of all you are gorgeous! Second, love the sweater! I just bought a painted metallic sweater in a deep purple color. I love the gold but I have light skin and it kinda washes me out? The purple stood out more but now im thinking …is it tacky? I need your fashion advice! Mine is cropped with an over the shoulder kinda neckline. Thinking of going back for the gold if the purple is a no no. Whatcha think? The purple is pretty. Mine was bongo…16.99. You got a much better deal!